The western North Pacific has had a quieter than average typhoon season so far with only five tropical storms attaining typhoon status (winds of 74 mph or greater). 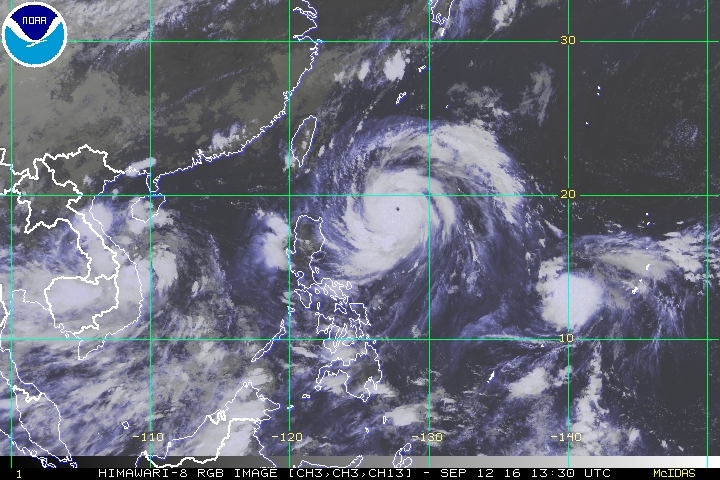 However, the latest storm which formed over the weekend, named Meranti, has rapidly developed into an intense typhoon. Meranti is currently located to the east of the Philippines and is moving west-north-west. Winds averaged over 1-minute are estimated to be near 180 mph making Meranti equivalent to a category 5 hurricane. Globally, it is just the fourth tropical cyclone to reached category 5 this year. There is some uncertainty in the forecast track at present. 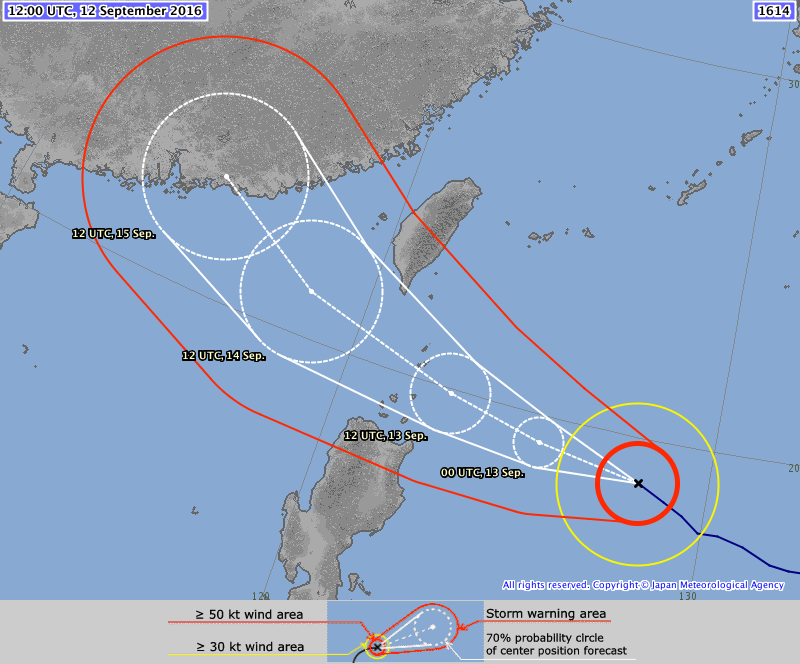 The official warning agency for the region, the Japan Meteorological Agency, expects the centre of the typhoon to pass through the Luzon Strait between the Philippines and Taiwan as shown in the forecast chart. However, a slight shift north or south is possible which would bring Meranti closer to one of these two land masses. Even if Meranti follows the latest forecast, both Taiwan and the northern Philippines are likely to experience rain and wind from the periphery of the typhoon as it passes by. After passing through the Luzon Strait Typhoon Meranti is expected to make landfall over China. However, the uncertainty in the forecast at present means that a large portion of the coast should remain on alert including areas west of Hong Kong to areas adjacent to the Taiwan Strait. Official forecast track for Typhoon Meranti from the Japan Meteorological Agency. The white dotted line is the most likely track of the centre of the typhoon. Meranti is not the only west Pacific tropical system being watched at the moment. A tropical depression located to the east of Meranti is expected to strengthen and may also become a typhoon. This is likely to track a little further north than Meranti with areas under threat including northern Taiwan, the Ryukyu Islands and mainland Japan. Official warnings for the latest tropical cyclones in the western North Pacific are produced by the Japan Meteorological Agency. The Met Office routinely supplies predictions of cyclone tracks from its global forecast model to regional meteorological centres worldwide, which are used along with guidance from other models in the production of forecasts and guidance. We also provide updates on current tropical storms via @metofficestorms on Twitter. This entry was posted in Met Office News and tagged flooding, heavy rain, hurricane, Japan, Japan Meteorological Agency, landslides, Philippines, Ryukyu Islands, Storm, Taiwan, tropical cyclone, tropical storm, Typhoon, Typhoon Meranti. Bookmark the permalink.